Another bridesmaid dress is done! And of course gave it the same pleated skirt as the other two. 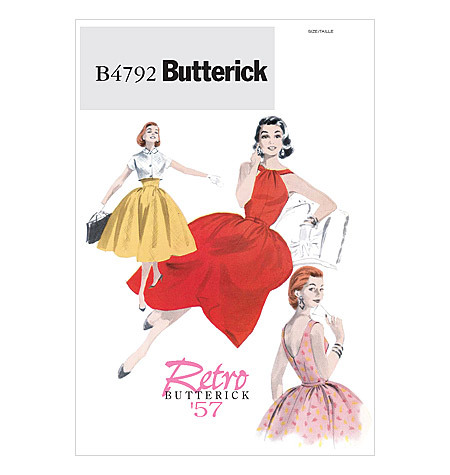 I used this vintage reprint Butterick pattern, B4792. 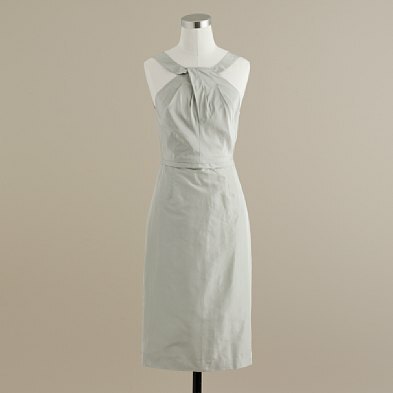 It's different construction than the J.Crew dress, but the same shape and look from afar. You can also see Shauna's bridesmaid dress and Robin's bridesmaid dress. All five bridesmaids will be wearing the same pale grey cotton blend, and purple shoes and cardis. Just started reading your blog, I love it! Love them all! They fit your bridesmaids perfectly! The fit of the dress is amazing. I really don't think the top gathered neck goes with the sharp pleats of the skirt though. With all the BRILLIANT Home made things going into your wedding decor and fashions, someone better put it in a bridal magazine. Seriously!!! I like that you call her your fiance's "little sister" and she's a young Amazon woman. What a flattering cut on her! Wonderful job! I'm so impressed with how you get all the dresses to fit so well. I have a hard enough time getting my own dresses to fit - I couldn't even begin to imagine making a dress for someone else. Especially a fitted on. Way to go! This is my favorite so far... she looks gorgeous. that is great!! and how proud will you be when they are wearing them and you can say you made them all! So Impressive! ooh, this is my favorite of the 3 you've shown so far. Way to go! This is my favorite yet, I am so jealous of your brides maids! Not only are you making their dresses, but they are lovely and definitely will be able to be worn after the wedding too. Beautiful! and I like your 'soon to be' little sister's pixie hair look, cute! This is my favorite of the three bridesmaid dresses! This is my favourite one so far! And you have done a fantastic job on making them all! I love this one! And she's gorgeous too. She almost looks like Carey Mulligan! Beautiful. I look forward to seeing all five together. Oh my gosh! Will you make me one!? I mean, after your wedding is over. And your future Sis-in-law is gorgeous! Excuse the shallowness, but between you and your bridesmaids, you are going to have beautiful wedding photos! Ditto!! This is also my favorite bridesmaid dress so far!! Beautiful!!! You all are so kind! Yes, I am lucky to have such beautiful bridesmaids (and excellent models) and I hope they can wear their dresses again! I really love all these bridesmaid dresses! They will fit your girls perfectly! You are doing such an amazing job and I adore reading all about it! Keep up the great work! Adorable dress! And she is INSANELY cute--love her hair!